The perfect gift if you want something special to give for a special occasion. 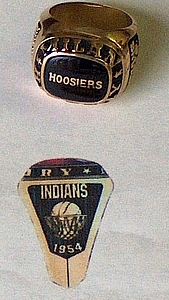 Both the Milan Indians and Hickory Huskers are featured in the design on these one-of-a-kind Commemorative rings. The rings are specially ordered. Delivery time is 8-10 weeks. Available in Yellow Lustrium ($470) or 10K Gold ($2300).